FotoFuse is the fastest, easiest way to share your stories using your photos. 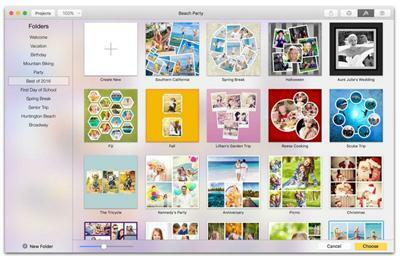 Simply drag your photos into pre-designed layouts for amazing results. For a little extra flare, add text and artwork. After your masterpiece is finished, you can share it via email, AirDrop, Twitter, Facebook, Flickr, Messages, and more. 550+ Templates: Choose a template and then drop in your photos. FotoFuses comes with 550+ layouts in professional-looking configurations to make your photos look great. Once you've chosen a layout, drop in your photos using the built-in Photos browser. It's fast, it's easy, and it's fun! Aspect Ratios: Supports popular aspect ratios. FotoFuse supports popular aspect ratios (1x1, 2x3, 3x2, 3x4, 4x3) so you can create a photo frame suitable for sharing on social media platforms, ordering prints at your local photo store, etc. Special Effects: Apply filters, masks, enhancements, and textures to your photos. It's easy to make your photos look spectacular with FotoFuse by enhancing colors, applying masks (100+ included), apply special effects (30+ included), and adding textures (33 overlays in 6 categories: folded, crumpled, canvas, linen, textured, paint). One-Click Frames: Instantly add frames to your photos. Make your layouts stand out by customizing your photos with one-click frames. Choose from 10+ different frame styles (photo corners, tape, staples, scalloped edges, Polaroid, Mat, burnt edges, etc.). Each style is customizable so you customize attributes like color, border tickness, etc. Text & Artwork: Includes everything you need to create masterpieces. FotoFuse is a complete solution. It includes everything you to adorns your layouts with text, shapes, special effects, backgrounds, and artwork. Projects Browser: Manage all of your projects from one big browser. FotoFuse comes with an ingenious Projects Browser. The browser slides in and fills the entire window so you have maximum screen space to manage your projects. This innovative design also frees up space in the main window so your design canvas is maximized.